Brochures and booklets are at the heart of great marketing and allow you to promote and market your brand in a way that best communicates your key values and benefits. Our creative team can design any style of brochure, booklet or folder to suit your requirements and will work closely with you to ensure the finished product exceeds your expectations. A professionally designed folder is a truly versatile marketing tool and one of the most popular ways to achieve a professional image. Using a folder can be particularly cost effective if you're in a business where information changes quickly and the contents require updating regularly. 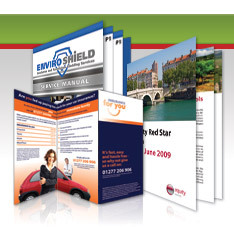 We have a huge range of printing solutions available including 8 page to 48 page booklets, 4 page folded leaflets and glued/interlocking folders. For full details and pricing please visit Appletree Print below, or contact our team for a quotation. Your creative and corporate brochure designer will talk in-depth about your requirements, taking into account any ideas you may have. Your brochure designer will begin work on your brochure design and email you the booklet concept board within 48 hours. Once you have viewed the initial concept you may discuss any changes with your booklet designer and he/she will continue to revise your booklet design until you are happy (unlimited revisions). Once you have signed off the brochure design, your brochure designer will prepare for either print or send. If you have selected printing, your brochure will be printed and sent to you. If you have selected design only, your final brochure design will be prepared in high resolution print ready format and emailed to you.